The drive from Negombo to Minneriya National Park is longer than three hours. Avoid the stress of planning out rides back and forth with this all-inclusive Minneriya elephant safari tour. 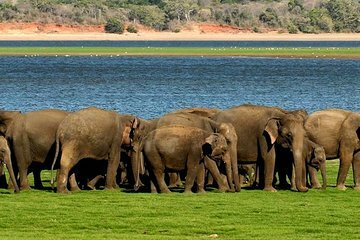 Along with a guided Jeep safari through the elephant natural habitat within Minneriya National Park, you’ll also visit two UNESCO World Heritage Sites, Sigiriya and Dambulla cave temples.